You have angered me; feel my wrath!!! Rasberry Zinger: Hibiscus, Rosehips, Roasted Chicory, Orange Peel, Blackberry Leaves, “Natural Raspberry Flavor with ‘other’ Natural Flavors (contains soy lecithin), oh, and raspberries and raspberry leaves. Country Peach Passion: Rosehips, Hibiscus, Orange Peel, Roasted Chicory, Chamomile, Blackberry leaves, “Natural Peach and Passion Fruit Flavors with ‘other’ Natural Flavors (contains soy lecithin), oh, and peaches and citric acid. Cranberry Apple Zinger: Hibiscus, Cinnamon, Roasted Chicory, “Natural flavors” (contains soy lecithin), Chamomile, Blackberry Leaves, oh, and cranberries and apples. Tangerine Orange Zinger: Hibiscus, Rosehips, Blackberry Leaves (again), “Natural Tangerine Flavor with ‘other’ Natural Flavors (contains soy lecithin), orange peel and hawthorn berries. Black Cherry Berry: Hibiscus, Rosehips, Roasted Chicory, Blackberry Leaves, Hawthorn Berries, “Natural Black Cherry Flavor with ‘other’ Natural Flavors (contains soy lecithin), Chamomile, oh, and sweet cherries. One would think one could at least expect that if a tea was describe as “Raspberry flavored”, some form of raspberries would appear before the last ingredient. One might think that if a tea was named “Cranberry Apple”, it’s dominate flavors would indeed be cranberry and apple. Instead, what one finds is that the tea is largely cheap fillers, much like putting sawdust in bread. There is very little to differentiate the tea flavors, except perhaps the illustrations on the box. If you take a mouthful and close your eyes, the dominate flavors have nothing to do with the advertised product. Sampling all five of these teas finds them more similar than dissimilar in flavor. As a warm liquid fairly high in vitamin C, I suppose you excel. If your goal was actually, as claimed, to produce varying flavors, each enjoyable and distinct from one another, you have failed abysmally. If you won’t change your ingredients, at least change your names. “Hint of Cherry Hibiscus” or perhaps “Naturally Flavored Hibiscus.” Then your customers will know what to expect. Honesty is always a good policy. Yes, I wasted 42 cents mailing this out. I have nothing more to say, except to point out the obvious: it’s the middle of Febuary in the frozen North. Plus, having informed them of their abominable product, I no longer feel the need to seeth every time I see the box. They have been notified of their failure; to think of it now only wastes time and energy, of which I have plenty of other uses. No pictures as proof, but I recently hosted a pie party. This is where I provide the dough and apples, everyone brings their own pie plates, and we peel and cut apples till everyone has their pies. I made enough dough to use up about 5 lbs. of shortening and 7 lbs of flour, and all told we peeled and cut 90 cups of apples. Between the three of us. And they each only took home one pie. So we’re eating the rest. But we’re not complaining. Though you actually can eat apple pie to the point you don’t feel like eating any more apple pie. Even if you are a barbarian. One of the age-old complaints of woman against man has been that man leaves the toilet seat up. I have never, ever, ever understood that complaint. Yes, I am female. And yes, I have been the victim of toilet seats left up. In fact, I probably lowered more toilet seats in my first year of potty training than most women do in their lifetimes. But you know what? For every toilet seat I’ve lowered, someone had to raise it. And if men are obliged to raise the darn toilet seat every time they want to go pee, there is nothing unfair whatsoever about women having to lower the seat every time they want to go pee. In fact, making man have to do all the raising and lowering himself is discriminating against him. If both have equal rights to the toilet, both have equal responsibility to the position of the toilet seat. Guess what, ladies? Equality ain’t all peaches and cream. Yes, I know I broke the mold. I couldn’t bear to post them any smaller, and I’ve been meaning to adjust this template wider. Maybe this will actually get me to do that. A new camera has entered the household, and it makes it very easy to experiment with f-stops and shutter speeds. I always thought that “stuff” was too complicated for me, but I don’t think I’d have ever been able to get these shots without it. Naturally, I’m pleased out of my poor little mind that they came out exactly how I’d wanted them to. My one complaint is that I still sometimes have a hard time getting it to focus on what I want to focus. None of these photos have been touched up in the least; they’ve just been reduced and compressed for the web. I didn’t think they needed any improvement, apart from sometimes being in better focus. And after the picture has been taken, it’s a little late for that. The one photographer’s trick that I did employ was taking lots and lots and lots of pictures. Like, 60 of them. Those were just my 10 favorite. And yes, I did take a bit of poetic license calling this post “In the Bleak Midwinter” when, for goodness sake, it’s in the middle of April. But, also for goodness sake, we’re supposedly supposed to have 10 to 16 inches of snow in the next 24 hours. I don’t believe it, in case you’re wondering. 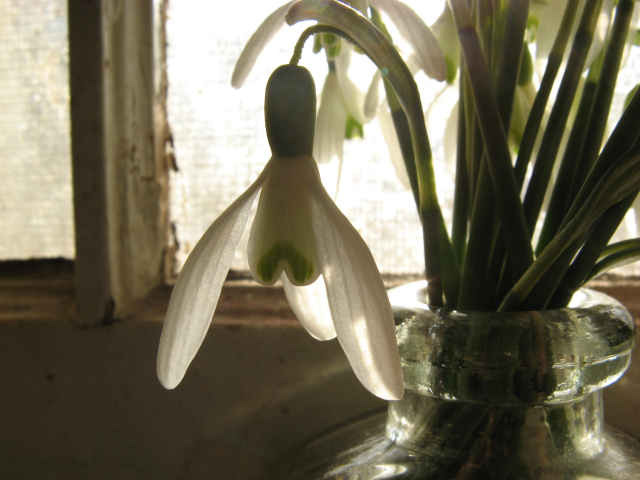 But I did think that the flowers looked like they were bravely facing up to the bleak midwinter. 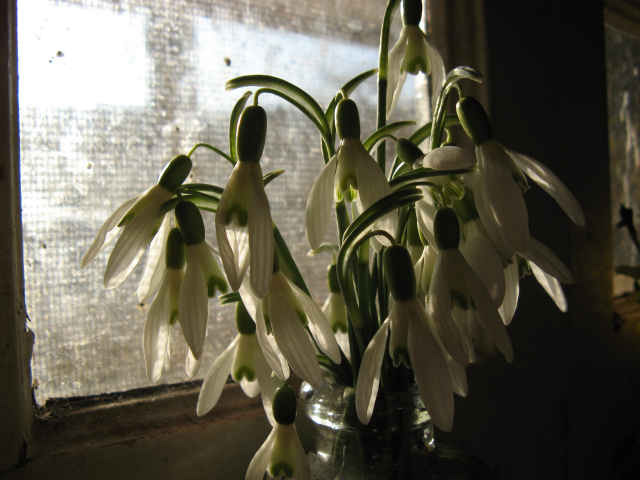 They’re surrounded by darkness, but basking in a light all their own, the light of Spring on it’s way. Here’s three more, for a bonus. They almost made the cut, but didn’t quite fit. I took this one after I had figured out how to focus better, but by then the lighting had changed, and it lost some of it’s magic. Sharper, but not so radiant. I liked the angle of this shot. 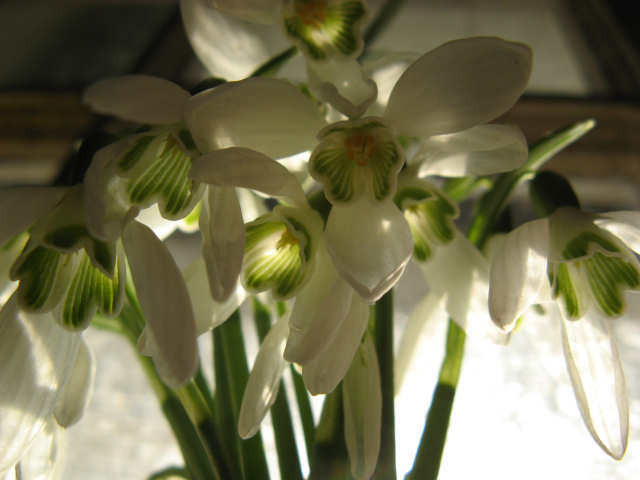 I love seeing the inside of the snowdrops, so often overlooked by the towering human perspective, but really quite captivating. 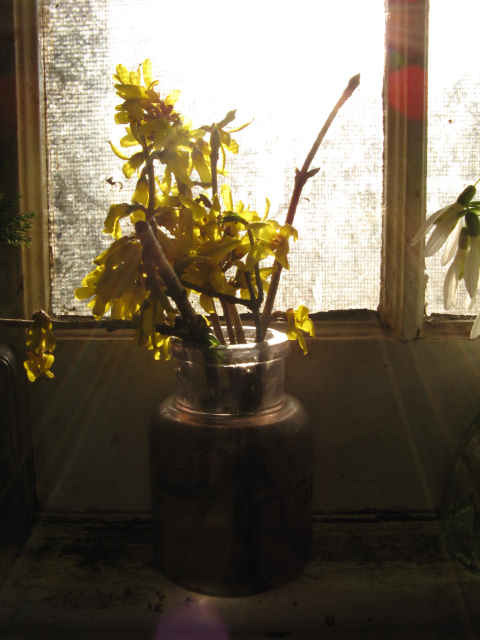 Unfortunately, it didn’t have the breath-taking sunlight catching in it’s petals. I’m pretty sure I could have adjusted the lightness in a photo-editing program, but you know what? There’s no good substitute for the real thing. I could have made the picture lighter, but I couldn’t have shot it through with beams of sunlight. Better luck next time, I guess. 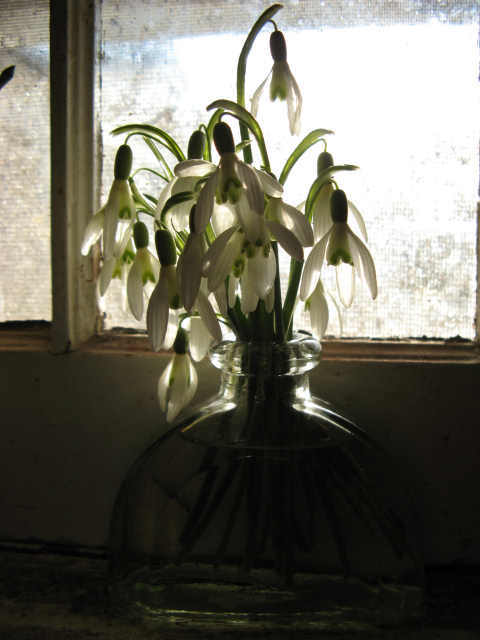 It’s the stems of the snowdrops! The same light as before, but the shutter speed and f-stops have been monkeyed with. I love how it looks like I’m taking a picture underwater, but really it’s just the texture of the glass vase they were in. And what, you may ask, does any of this have to do with cooking? Nothing. I’m branching out. My life has to do with a lot more than just cook, and it’s giving me mind cramps trying to stay on topic. The barbarians may need their stew, but I’m filling up just fine on these. 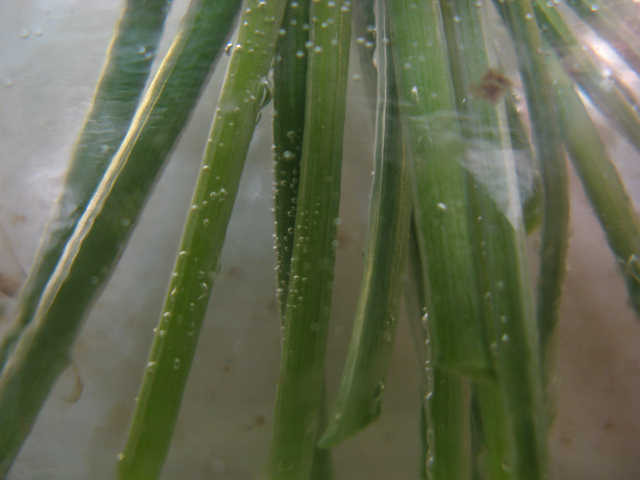 *When you leave them in a pot, they don’t get hot and burn your fingers when you come back. *If you drop them in the gravy by accident, they float. *They don’t get bent out of shape when you apply stern pressure. *When you lick the chocolate pudding off of them, it reminds you of eating a fudgsicle. They are nice in every way. So why, why, why are they so hard to find? I especially like the “paddles”. The closest I’ve been able to find are bamboo utensils, but those are usually meant for “stir-frys” and are huge and unweildly. “That was very false economy,” remarked Mrs. Fairfax, who now again caught the drift of the dialogue. 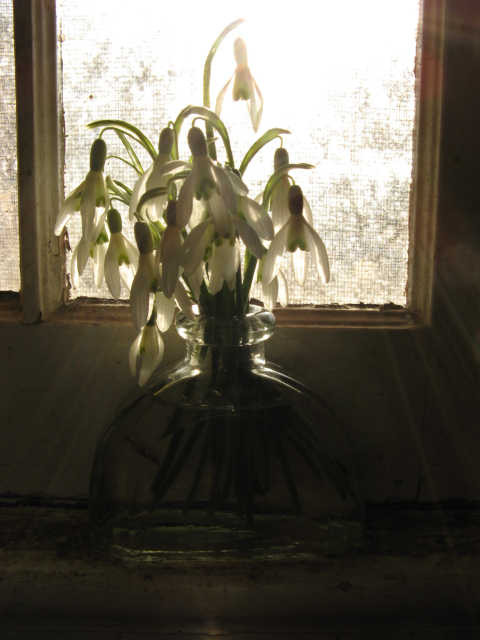 From Jane Eyre, chapter 13, by Charlotte Bronte. Oh, the cruel, cold and senseless things done in the name of economy. This dreadful topic was brought to my mind as I attempted to read America’s Cheapest Family Gets You Right on the Money, by Steve and Annette Economides. Before currency, there was a barter system. With the barter system, everyone knew what good economy was: get the most of what you want, while giving away the least of what you want to keep. Now, with all buying power “standardized”, people seem to have totally forgotten what economy really is. Let’s say you want to buy a car. I offer to sell you one for $100. What a deal, right? Hah! Everyone knows better than that. Unless you are looking for a complete fixer-upper-hobby car, you know that any car being sold for $100 is incapable of meeting the needs you have for a new car. It won’t run, or it will keep breaking down, or perhaps it’s just been stolen and somebody needs to unload it fast. In other words, since the car doesn’t accomplish your goals, it doesn’t matter how cheap it is, it’s still a bad idea—false economy. Now, we must ponder, is this economical? Leaving aside all questions of the ethics and rights of picky eaters (when I was a child, onion physically hurt my tongue, it was so strong. I wouldn’t eat them; now I do—they no longer cause me pain) and the merits of canned beets (never mind tasting like dirt, I have to suppress a gag instinct just to get a bite down), let us focus on the question of whether or not it is economical to eat things you really do not enjoy. If buying things that do not accomplish your goal—whether it is worthless thread that won’t hold a mending job, or a car that won’t run—is bad economy regardless of price, then the question becomes this: What is the goal of obtaining edible substances? Does it have anything to do with flavor? Of allowing people to have unique and individual tastes in everything, including food? Does it have anything to do with texture? Does it have anything to do with enjoying yourself? 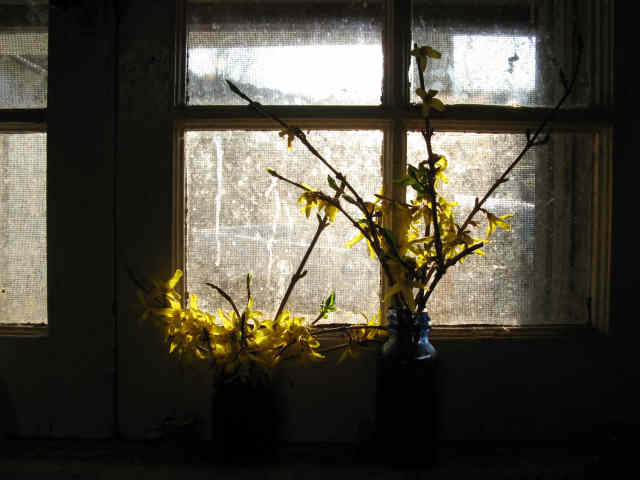 Is is it meant to nourish, encourage good health, and provide for a body’s specific need? Or is it merely meant to keep you physically alive, and at the least monetary cost possible? No matter which way you answer the question, it is still false economy. Why? Because if food has anything to do with first set of questions, being forced to eat cheap but disgusting food is not fulfilling the purposes of buying food. And if you answer yes to the second question, it is false economy because there are much cheaper ways to accomplish that goal: allow me, for instance, to introduce you to some dumpsters. Foreign dignitaries have long marveled at the things Americans throw away; they could easily feed their villages with it. Why not? You doubt that dumpster-diving is capable of sustaining life? Allow me to introduce you to Malika Oufkir, who has written two books, Stolen Lives and Freedom: The Story of my Second Life. (Incidentally, it is rather disturbing how many unique hits you will find on Amazon when searching for “prison diary”—and I’m sure that there are many more that didn’t turn up under those keywords; Stolen Lives didn’t.) Now, I do not remember which book it was in—I think it was Freedom, but perhaps she mentioned it in both, but Malika shared her culinary accomplishments that she achieved during the imprisonment of her and her family. I don’t own either book, so I cannot quote directly, but it was a vivid enough description that it has quite stayed with me. First she takes the bread, quite stale, and she scrapes off as much of the rat poop and mold as she can. 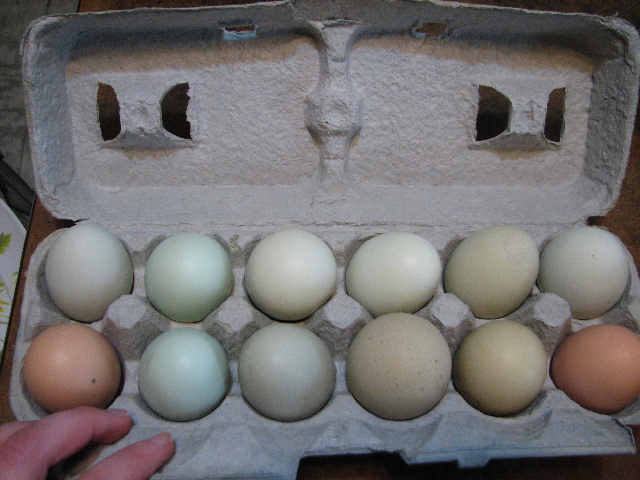 Then she breaks open some rotten eggs, which are quite black inside, and lets them sit in a shallow dish until the powerful stench has dissipated somewhat. 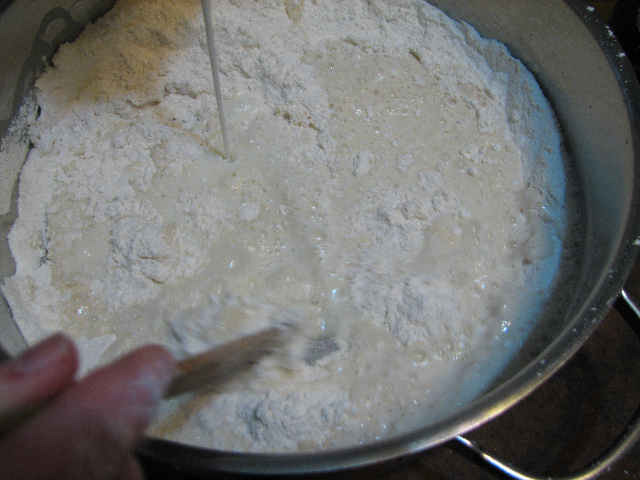 She adds a few pinches of sugar, and I think powdered milk? 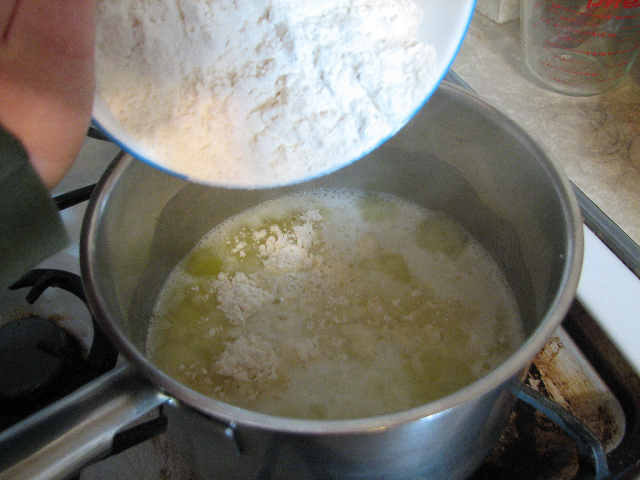 Then she soaks the broken bread in this mixture, and cooks it. Sort of like a prison version of French Toast. 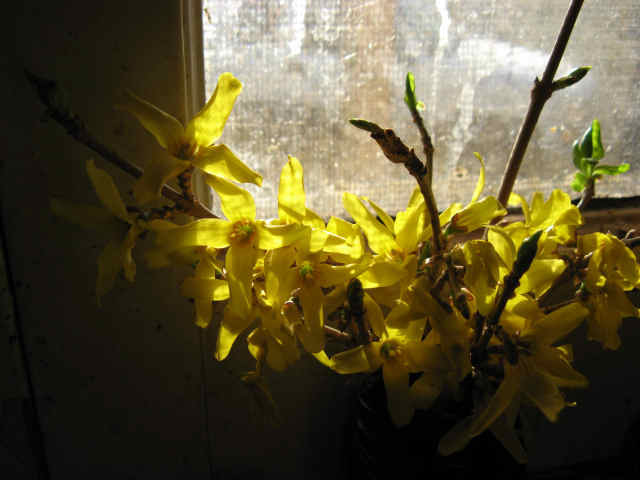 She reports that her family loved it—the closest thing to a culinary treat they could get. Is that foul mixture capable of sustaining life? Apparently. She’s still alive to relate the tale. But is that all food really needs to be? Certainly not! All members of her family have severe health problems left-over from their time of malnutrition (though certainly not all of their problems can be traced back to malnutrition). But do we fault any of them for eating it? Why would we? Their only other choice was no food at all. So while I certainly recognize that there is a time and place for eating detestable things, I don’t believe “economy” counts as a good reason. The money is short, and all you are able to buy is canned beets or nothing? Bring on the beets! But that’s a question of necessity, not economy, which is simply getting the most of what you want while giving up the least of what you want to keep. Of course, you may have discovered the loop-hole by now. Good economy is “getting the most of what you want, while giving away the least of what you want to keep”. In other words, it has very little to do with money at all. If you value, as they say on p. 34, “always be eating food that was purchased at the lowest possible price” more than you value the enjoyment of the life, food, and personal tastes that you have—well, it would seem to say that eating canned beets is indeed economical. The important thing is to realize that there is a difference between being “cheap” and being “economical”. Just because something is “the lowest possible price” doesn’t mean it’s economical. Looking for coupons, clipping coupons, remembering what coupons you have, finding the products you can use the coupons on, not loosing the coupons and remembering to use the coupons at the check-out are only economical if you value what ever amount of money is saved more than you value your time that you could have spent on other things. Eating fresh fruits and vegetables for only the first two weeks out of a month is only economical if you don’t mind eating processed fruits and vegetables, which loose some of their nutrients, taste and texture the more they are processed. You must keep in mind what purpose it is that you have set out to accomplish. For example, on p. 15, they tout that “By comparison, we spend just $350 per month to feed a family of seven, including three growing boys!” Yeah? There’s a little picture of their family on the front cover. I’ll admit the females look perfectly well-fed, but compared to the growing boys and young men I need to feed, their boys all look like scarecrows without enough straw. Of course, not everyone is feeding a bunch of hulking, muscle-bound barbarians like I am, but I can promise you that if I tried to serve, as they recommend, “yogurt with fruit and crackers” for lunch, many of them would wind up being shaky from hunger by supper. I’ve seen it happen before, and I can tell you that such a “light” meal is not capable of sustaining the crowd I’ve got to feed. It’s a snack, nothing more. It is not economical when it doesn’t accomplish it’s purpose. The plain fact of the matter is that different people have different nutritional needs. Another effective version of false economy is to only have female children, and give all the males up to adoption. Females eat a lot less than males. But even among males, there is a huge range of nutritional needs (some people will always be naturally skinny as a fence rail, but don’t expect everyone to live up to that). Even among any given individual, a persons needs will vary dramatically depending on what they’ve been doing that day. Perhaps the most money-saving advice would be to do as they do, and “live in a suburban area where six to ten chains compete for market share” (emphasis mine). That would be very economical—provided you had no problems living in a suburban area (and it makes me a little sick to think of it). Location does play a part. I imagine it’s even cheaper to sleep on a park bench, but, if I have I choice, I’d rather pass on both of them. What it comes down to is this: There Ain’t No Such Thing As a Free Lunch. You will always be paying somehow. The only question is how you will chose to pay. If you accept their economical system that “low dollar cost trumps all”, then most of their food shopping advice makes sense. But if anything—nearly anything at all—means more to you than hording all the little pieces of green paper that you can, you will find that most of the food shopping advice they give is as worthless to you as a car that won’t run. I have had people tell me before, “Why don’t you buy bottled spaghetti sauce? It’s actually cheaper than making your own!” Because I don’t think that U.S. dollars spent is the most important factor. The quality of homemade sauce far exceeds that of pre-bottled sauce. Therefore, I am getting more of what I want (good food), and the few pennies different is not enough to out-weigh it. You can buy chocolate eclairs for a fraction of the price and time it would take to buy it—but the store-bought ones will be insipid in comparison. If you want to save the most money, you might try looking in the dumpster out back to see if they’ve tossed any that were a day past expiration. If you want a true treat, something that is full of flavor and rich (as opposed to being full of fillers—commercial production specializes in keeping the cost of ingredients down), something that is truly extraordinary to eat. . .try making your own. Only you can decide which is most economical. Last weekend, I was making pancakes to send to a relative. Multiple barbarians came by and said things like “Yum!”, “Yay!” and the like, and all were met with “These aren’t for you”, which was responded directly with snarls and grumps. Finally I said if someone else made the batter, I’d make pancakes for lunch. That’s no small offer; it means making over 200 pancakes, with enough batter it wouldn’t fit in most peoples’ dishpans. Usually when I make pancakes, I keep them warm on platters in the oven until I’ve got them all made. Nobody can eat them till I’m done cooking. It takes about an hour of constant, high speed pancake turning to get them all made, and about 15 minutes for them all to disappear. I began turning out dozen after dozen of pancakes onto a platter on the counter. Everyone hung about like a flock of vultures, but not a one of them was fool enough to touch the pancakes (past experiences indicating it not a wise idea). After I had a small lead, I decided to allow that they could start eating them hot—and so I entered Pancake Purgatory. 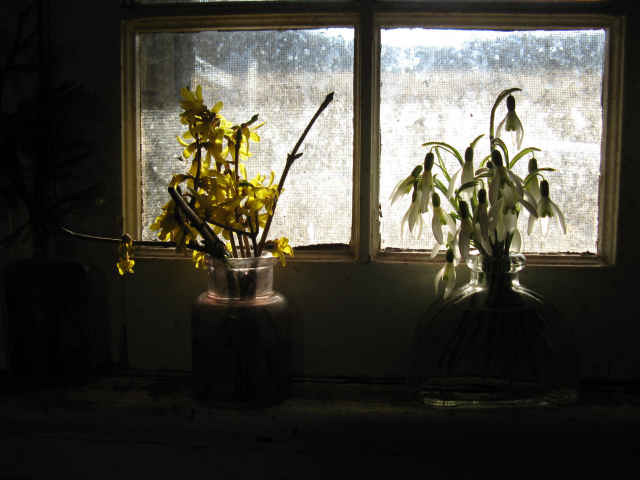 The lead that I had established disappeared in the time it would take an average human to sneeze, and people hadn’t even been called from the four corners of the house yet. Ever after that, any time I put down a pancake, it was snatched up off the platter in less time than it takes a germ to move (3-second rule, don’t cha know). I finally confessed I felt like I’d been sentenced to purgatory for 500 years to work of my sins with pointless labor. The consoled me that I only had enough sins to keep me there for 437 years. Did I triumph? Of course not. I stuffed them fuller than a Christmas goose, but they were hungry again in a few hours. As usual. 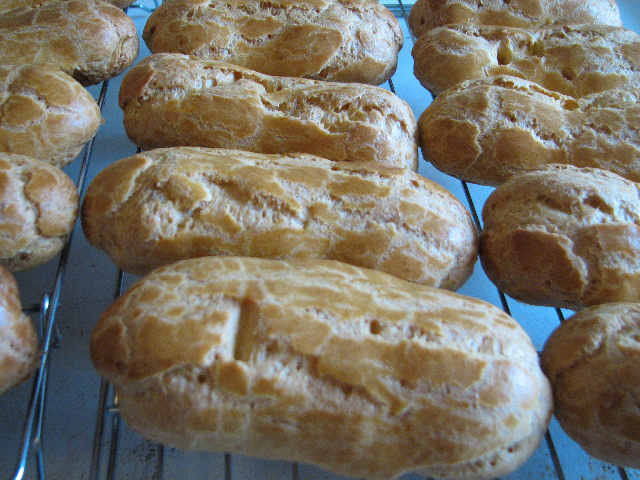 This recipe makes about 35 eclairs. For my audience, that means about two each, and everyone would have been more than glad to have more. Next time, maybe I will, because this recipe leaves you with 12 egg whites, which is only enough for one angel food cake. We really need two cakes to properly go around. Needless to say, this is a recipe I tend to make most often in when the spring chickens are putting out a dozen eggs a day. It’s all too easy to a get a gross of eggs sitting in the refrigerator if one doesn’t take drastic action such as this. 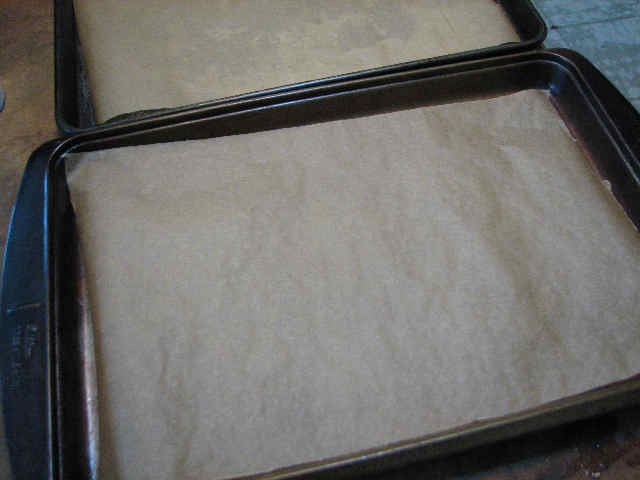 Line baking pans with parchment paper, and preheat oven to 425. Bring the water, butter, salt and sugar to a rolling boil. 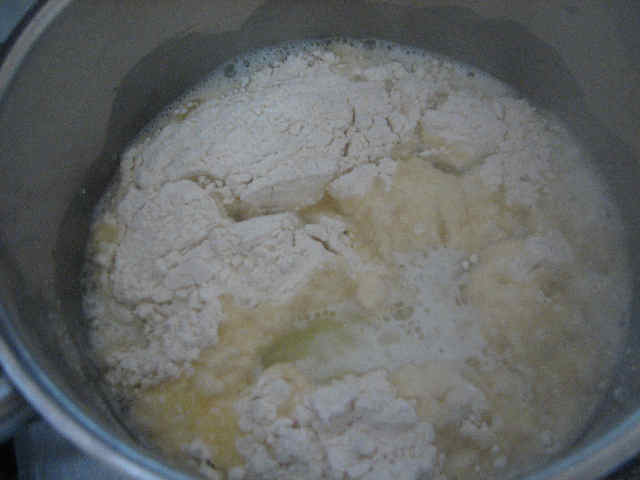 When it comes to a boil, turn off the heat, and dump in the flour all at once. Stir hard for 30-60 seconds. At this point, it will sort of look like a stiff paper mache paste. Return to heat, and cook, still stirring hard, for another 30 or so seconds. 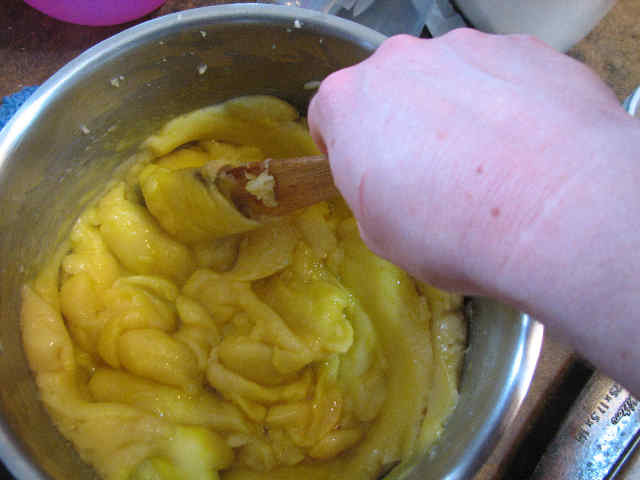 After this point, the original recipe recommends switching to a stand mixer with a paddle, or using a hand mixer. I continued to use my wooden stirring paddle, but it did give me a bit of a work out. It is very stiff, and kind of glossy. 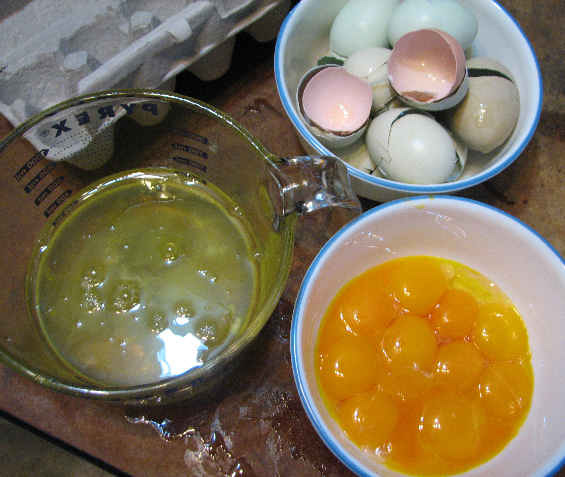 Start adding the eggs, one by one. 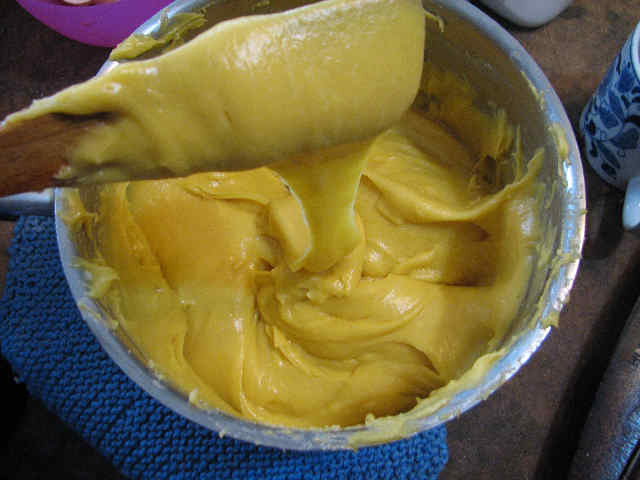 At first the mixture will separate and slip and slide; then it will join together and seem just as stiff as ever. 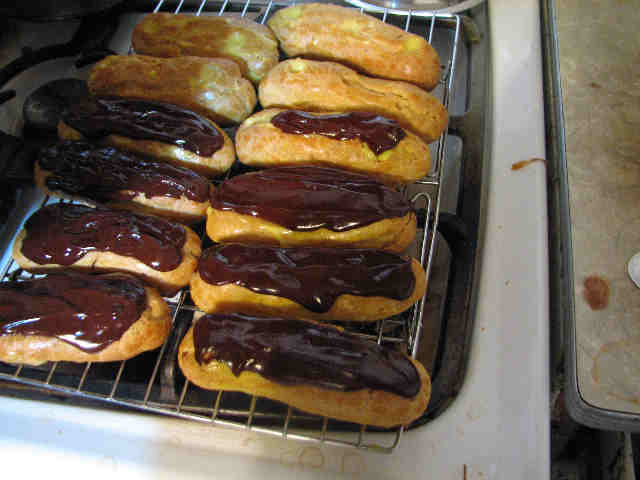 The original recipe said the mixture should be soft enough to slip off the paddle (I needed to use 7 or 8 eggs to get it that way), but I found I actually had an easier time forming the eclairs after the mixture had cooled to the point it was too stiff to slide off the paddle. You may want to stop at 6 eggs if you’re new to using a pastry bag. Alas, I couldn’t take pictures and pipe the eclairs at the same time, and I didn’t have anyone taking pictures at the time. So some of these following photos are part of a mock-up. Here’s a quick crash course in pastry bags. 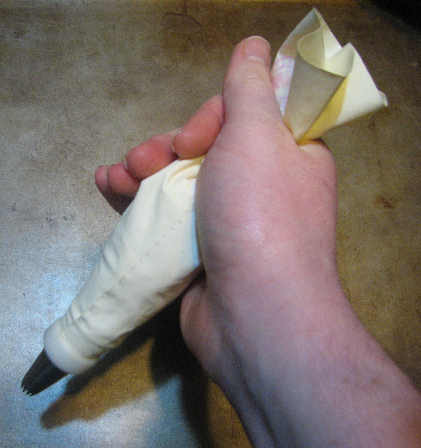 When I pipe the eclairs, I use my coupler with out any tip in it. This makes it easier to get an eclair the size I want it. I keep the notch in the coupler facing towards the baking sheet, to keep the eclairs more uniform. If you do use a tip, you rest the metal tip over the coupler, and then fasten it on with the coupler ring. 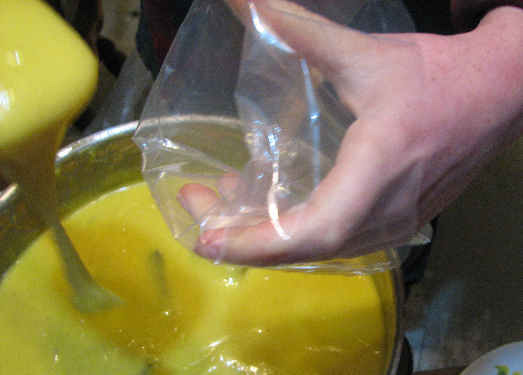 Fold back a cuff before you load the bag; it keeps the mess down, and the bag is easier to handle if it’s not slippery. Also, folding down that cuff keeps you from loading the bag too high. That means you still have enough bag left to twist the end shut. 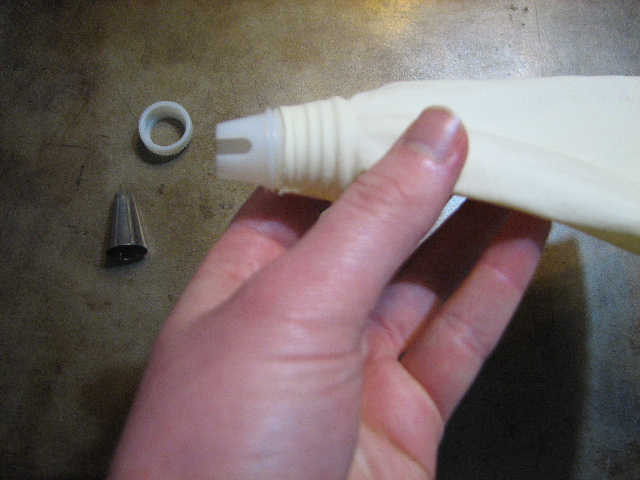 If you don’t firmly twist the end shut then when you squeeze the bag it will backfire—major mess and no filling coming out the little tip like it’s supposed to. 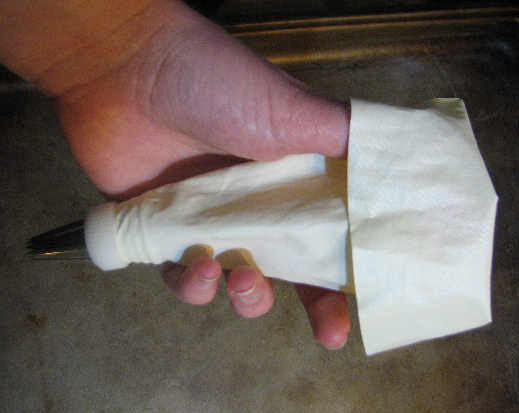 The twist is held shut with the thumb and pointer; the rest of the fingers control the pressure on the bag. 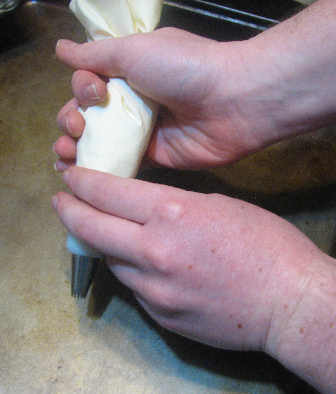 The other hand guides the tip. 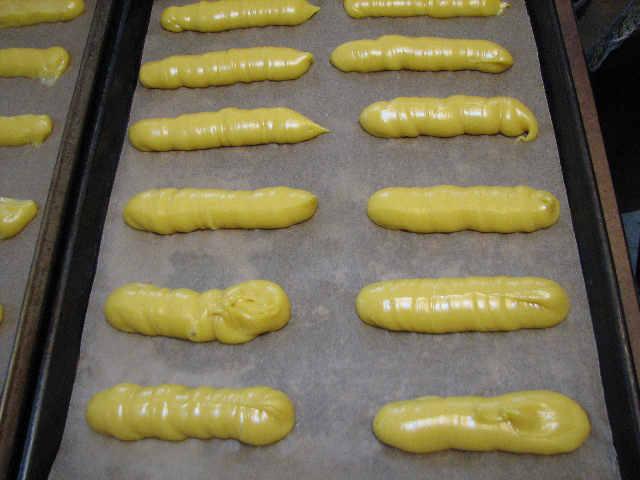 As for making the eclairs, you can really make them any shape or size you want. But they do puff up considerably in the oven. A general rule of thumb is that if you pipe out the filling the size of a hot-dog, you will wind up with an eclair the size of a hog-dog roll. You’ll need to move slowly and squeeze firmly. (I needed to use 3 pans, but it’s unwise to use more than 2 pans at a time in the oven. I piped the last pan after the first two came out, reusing the parchment. At that point, the dough was stiffer and easier to pipe. 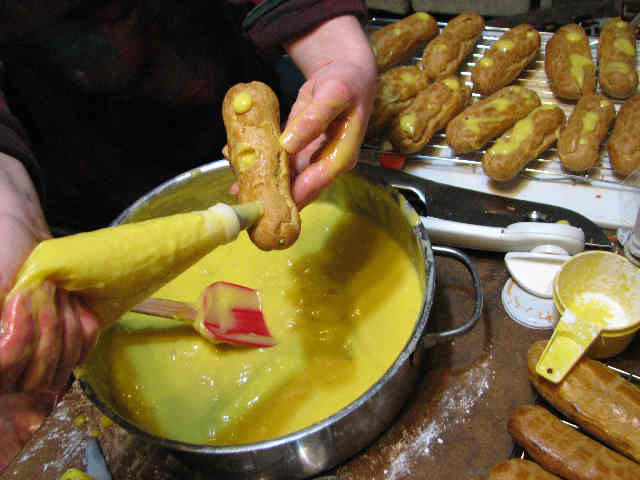 If you only used 6 eggs, you may find it too stiff to do it this way, and you may want to pipe all the eclairs at one time). At this point, you will probably have at least 6 people ask you why you are piping the filling before you bake the shells. Even if they asked you the same question last time you made them. 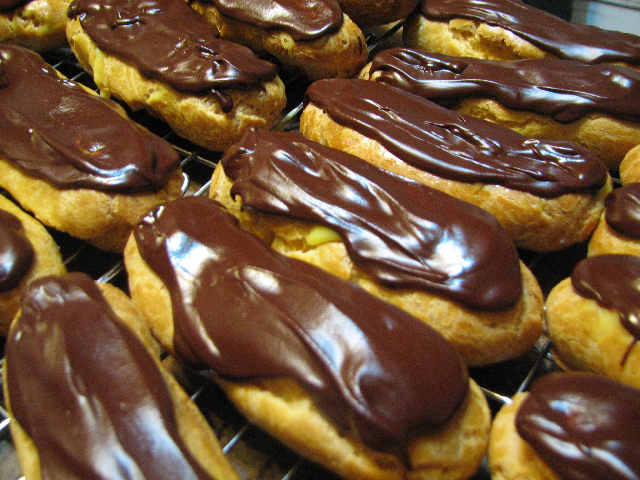 If your eclairs have funny lumps and bulges (mine? never!) they can be easily smoothed out with a wet finger. Don’t fret too much about it, though, because the puffing they do in the oven covers a multitude of sins. Next use a pastry brush to brush all the piped elcairs with an egg mixed with 1/2 TB water. This give the elcairs a nice gloss, but doesn’t do much else. So it’s okay to forget or deliberately omit this step. Bake in the pre-heated oven for 15 minutes, then reduce the heat to 375 for about another 25 minutes. When you reduce the heat, you should rotate the pans, top to bottom and left to right, but other than that, keep the oven closed. 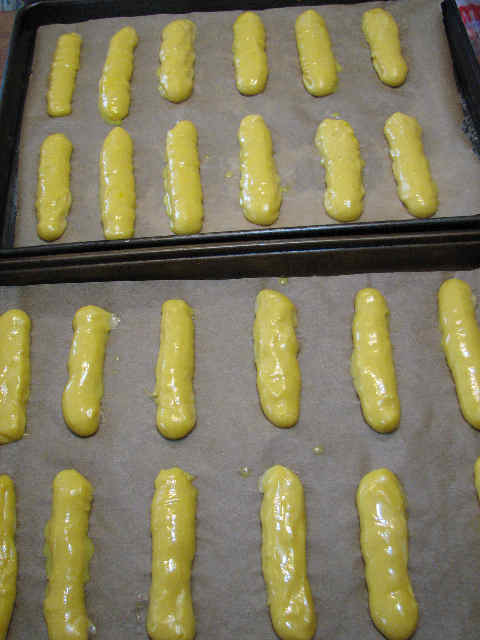 Steam is what makes the eclairs puff, and if you keep opening and closing the oven, you’ll wind up with flat eclairs. They should be a light golden brown when they’re finished. If you under-cook them, they’ll look great when you first take them out, but as they cool, they’ll deflate. They’ll be a little squishy or mushy, too, but you can make them work. If you over bake them, the can get a little burnt on the bottom. (And if you don’t rotate the pans, you’ll get one burnt pan and one mushy pan.) I’ve done both, and my advice is to err on the side of over baking. All the cream and chocolate pretty well drowns out a little over-browning on the bottom, but squishy, flat, eclairs are less appetizing (but still quite edible). This is a pretty good representation of their color when their done. These shells came out perfect. . .
. . . but since no cooking session is complete without a minor disaster, I messed up a bit on the filling. 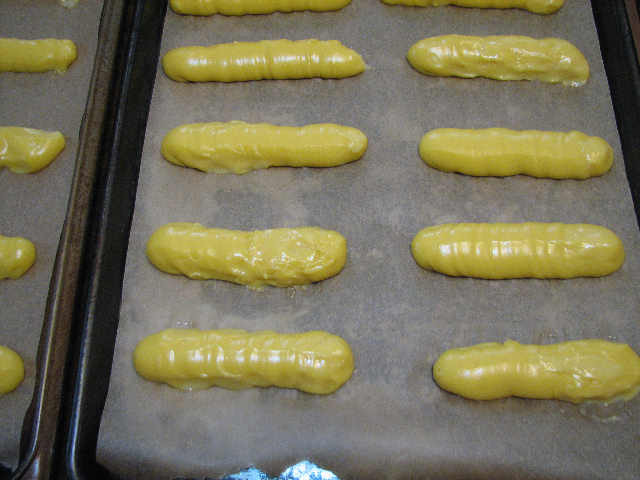 Learn from my mistakes, and make the filling the day before—filling the eclairs is much less than pleasant if your filling isn’t 100% chilled. If you made the shells early in the morning, and got right on the filling, you can still do it all in one day. If you do like what I did—namely, get distracted reading Howl’s Moving Castle until 11:30 am, and not even get started on the filling till mid-afternoon—well, you’ll be filling eclairs at 8 pm with filling that’s not properly set, and a horde of hungry barbarians standing over your shoulder. 2 vanilla beans or else vanilla extract. 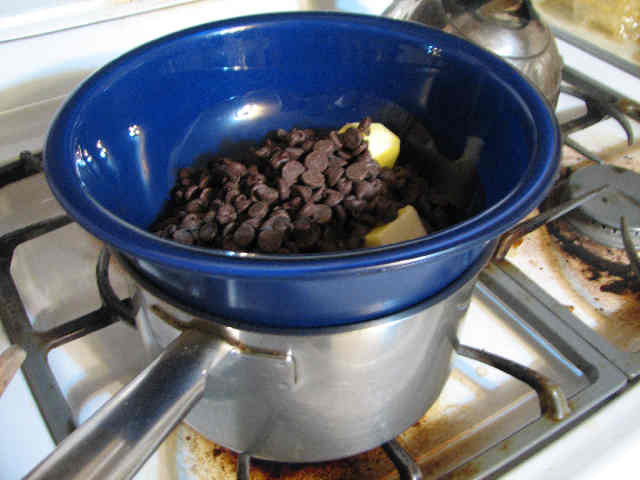 This is an adapted filling recipe; the original didn’t call for any type of vanilla. Usually I just use real vanilla extract in my baking, but since The Cheese Trap had some in that week, I decided to try real beans for once. (It was a $4 for 2 beans, much less expensive than Wegman’s was carrying them for. The Cheese Trap is sort of a general store/co-op sort of place. I know they buy their stuff from co-ops, and then re-package to sell.) Since the recipe doesn’t originally call for vanilla of any type, I don’t know how much extract to recommend. 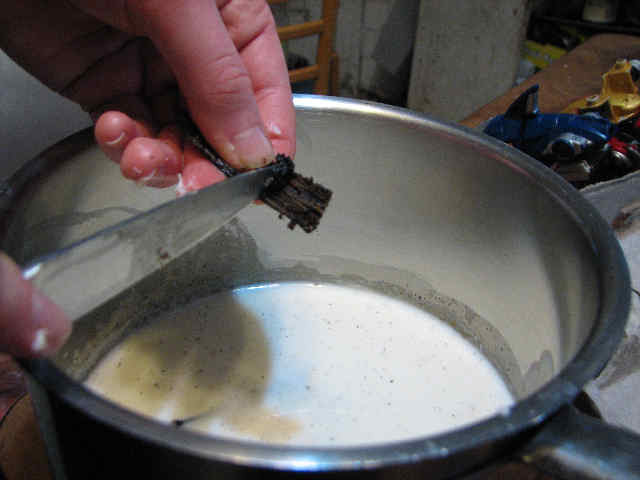 I tried using only one vanilla bean, and found it had too mild of a flavor for me, so I wound up using two. I cut the beans into thirds, and let them steep in 1 cup warm milk until the beans were soft. (Bring the milk and beans to a boil, then turn off heat and let sit 15 minutes.) 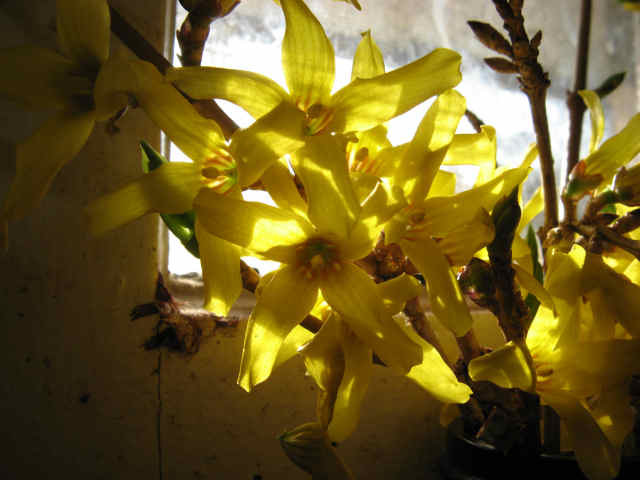 Then I scraped out the seeds, and let the whole thing steep longer. It’s supposed to be enough to just steep them in warm milk, but if I used beans again, I would make the custard the day before, and leave the beans sitting in the custard till I needed it. They’re easy to pick out, and will keep giving off flavor as long as they’re sitting it. 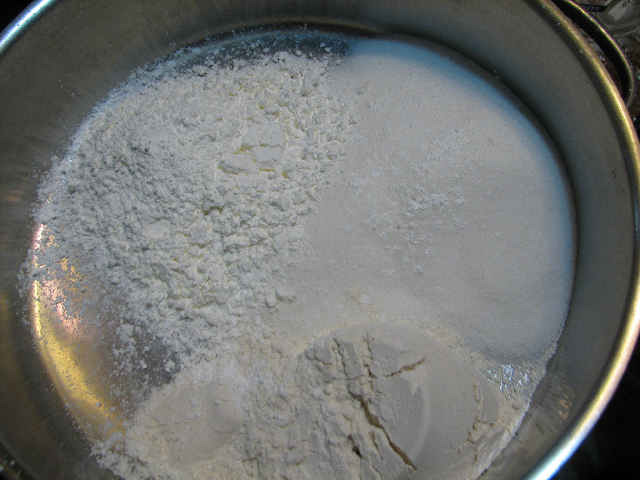 Put sugar, flour, and cornstarch in your pan, and whisk it together. 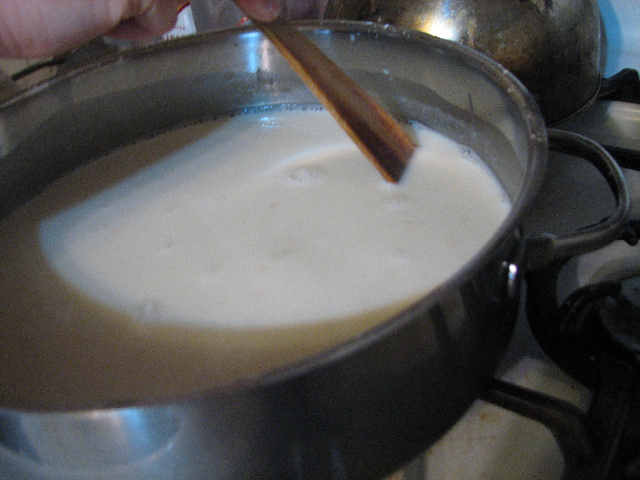 Whisk in your remaining 5 cups of milk until there are no lumps. 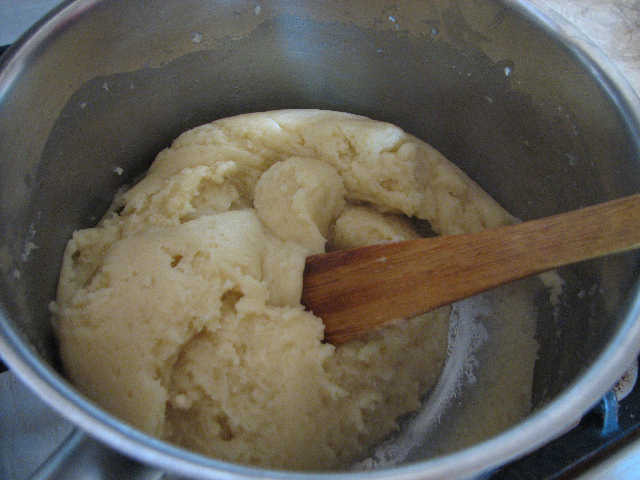 Cook over medium heat, stirring constantly, until thick and no longer has a raw, starchy taste (which can take up to 30 minutes). If you cook it on high heat, it will thicken up too quickly and on the bottom first. 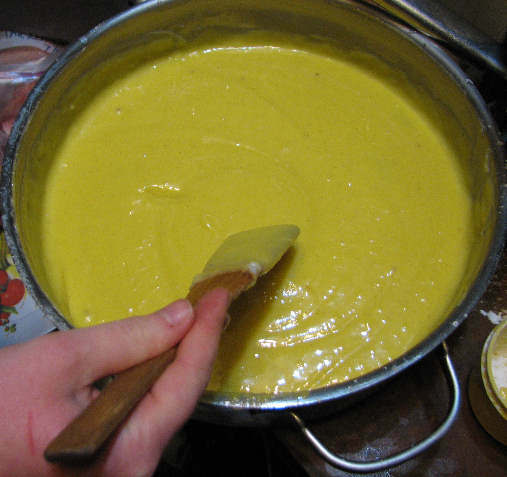 That will leave with clumps of thick filling on the bottom, and loose, soupy filling on the top. 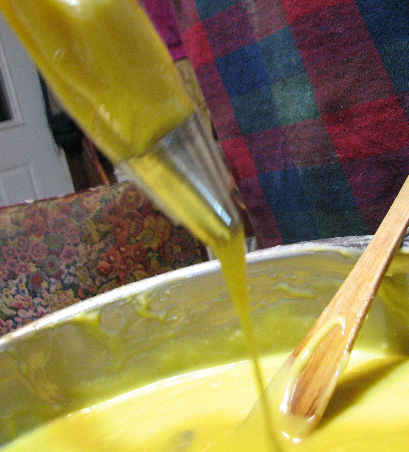 This can usually be remedied with lower heat and vigorous whisking, but it’s best to just avoid it in the first place and cook it on a lower heat. This was a time I had the heat on too high (I forgot my front burner was hotter than typical), so I found the filling thickened before the starchy taste was gone. I continued to cook it, over low-heat, till it didn’t taste so raw. I whisked in my remaining cup of milk/vanilla beans at this point, because I didn’t want to keep the vanilla beans that hot for so long; I’m thinking the flavor might not be that sturdy. Some people use the shells, some people use fancy gadgets, but I’ve found hands work the best. First crack your egg into a small tea-cup, so if the yolk decides to split open on you, you can just set that contrary egg aside and try again. 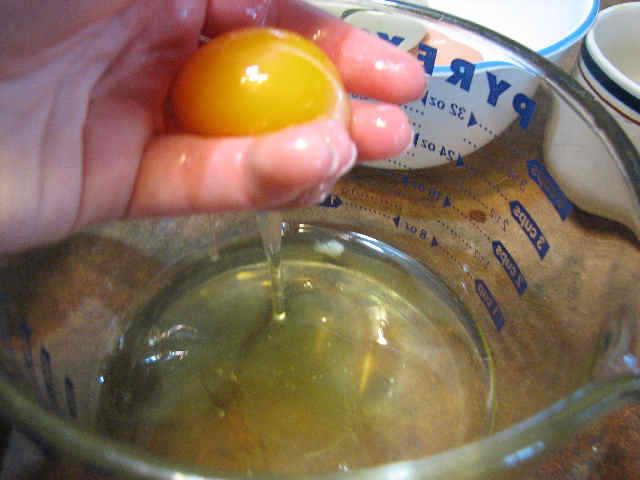 Then dump the whole egg into your hand, and let the white slip through your fingers. You’ll be left with nothing but a slimy yolk in your hand, which you then dump in your yolk bowl. You’ll have so many egg whites left over you can make an angel food cake, if you’re dutiful. 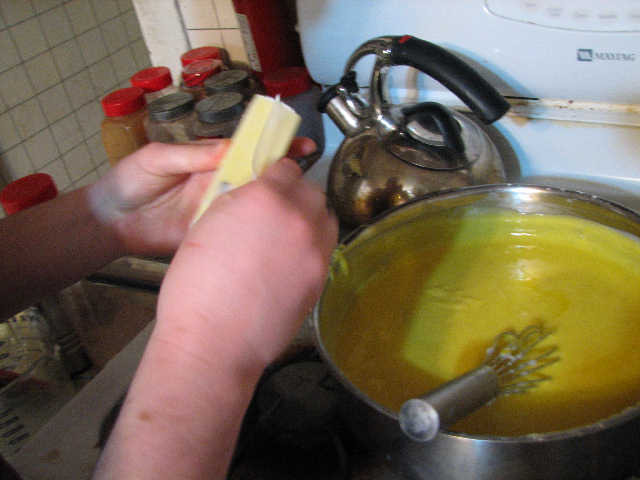 The eggs need to be tempered before you add them to the hot milk mixture, otherwise you get scrambled yolks in milk, not a thick, rich custard. 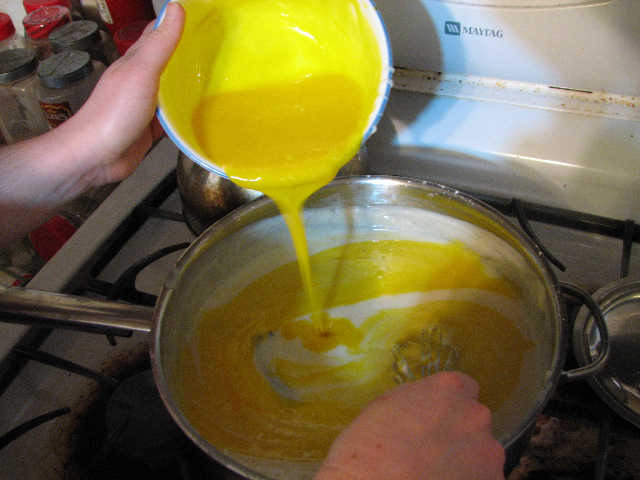 The yolks can’t be dumped in cold, they must be warmed up before adding them to hot milk. 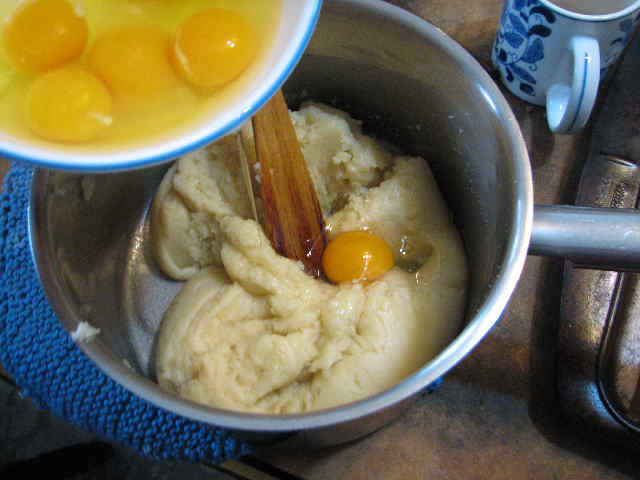 This is accomplished by spooning some of the hot filling into the yolks, and stirring well. I do that several times, until the bowl begins to feel warm in my hands. 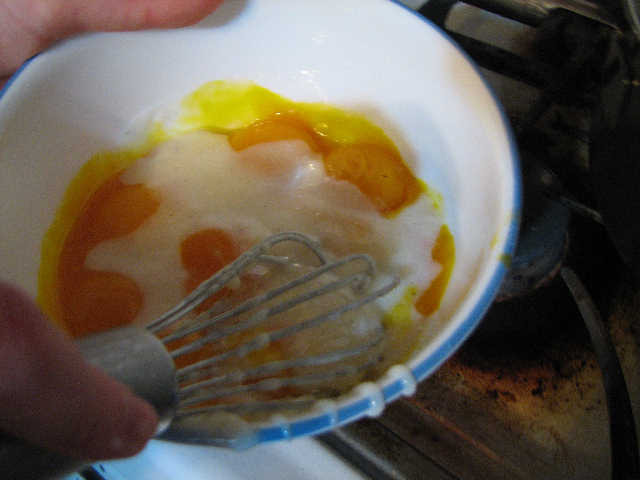 Then rapidly whisk the yolk mixture into the milk mixture. 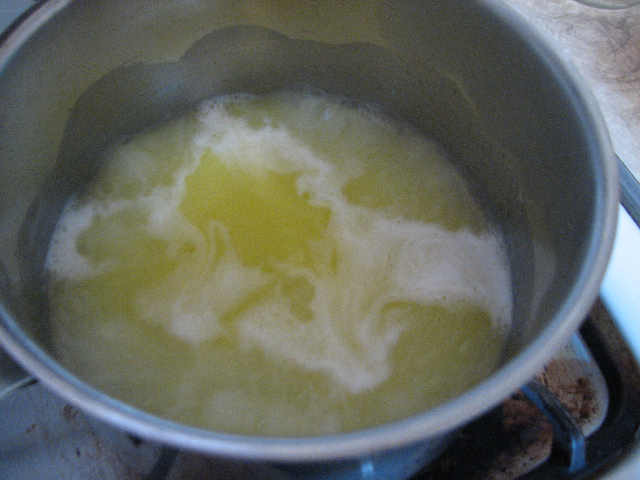 Add the butter in, too, and keep stirring till it’s melted in. 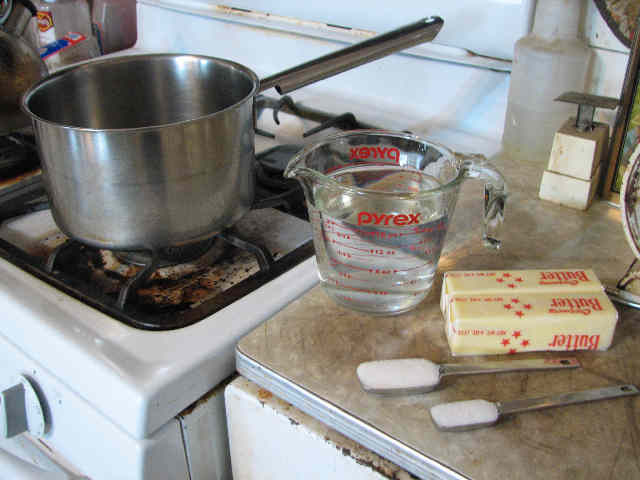 I set up pan with water in the bottom and a glass bowl on top to make my own double boiler. The water underneath the pan should be simmering. 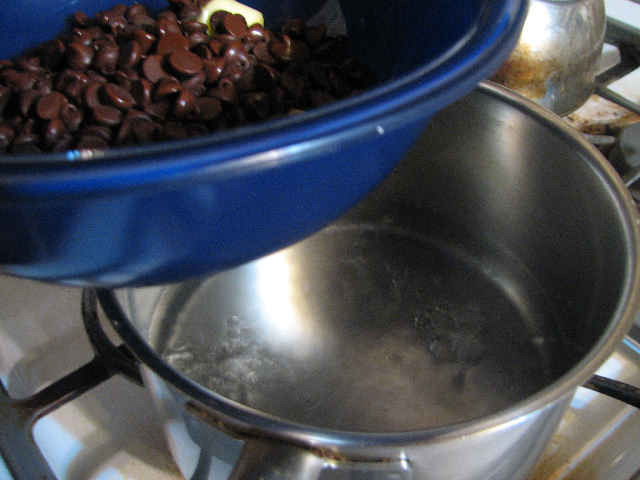 Then I just melt chocolate as needed, in a ratio of 1/2 cup chocolate chips to 2 TB butter. I think I used about 2 cups of chocolate chips and a stick of butter, but I can’t remember. It should melt until totally smooth, with no lumps. 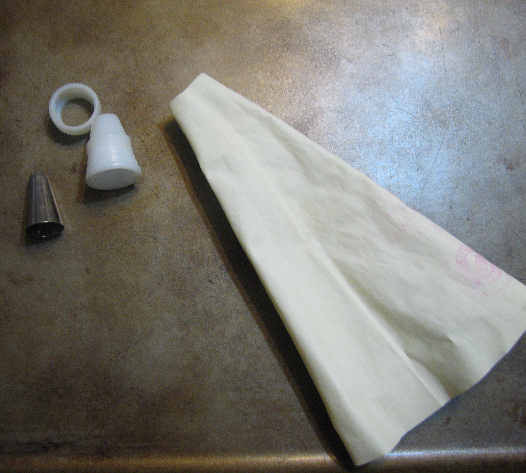 Set-up your pastry bag with a large tip (star or round, it doesn’t matter), and load it with completely chilled filling. Here I’m using a disposable pastry bag. If it isn’t cold enough, it will slip right through your tip without any pressure, leading to a filling where you want it and where you don’t—in other words, all over the place. 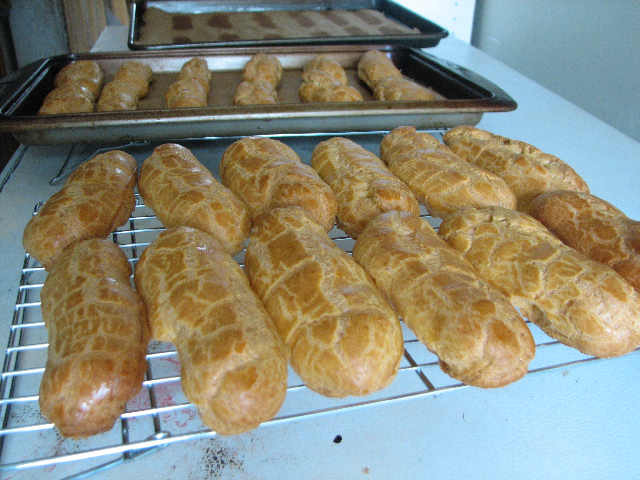 The steam has made the eclairs mostly hollow (you can break one open to see, or just take my word for it) but they can still have a few walls on the inside. I make two or three holes on the top (just break the holes with your finger), and stick the tip of the pastry bag into the holes. If there is no walls on the inside, you can usually see the filling squirting back up through the other two holes. If you don’t see that happen, you’ll need to fill each hole individually. These holes get covered with a nice thick layer of glaze. Endless eclairs. Your hours of work will be downed in a few short moments. Yum. My biggest and best secret for being a good cook is to only feed hungry people. I kid you not. I suppose a lot of people think that the saying “Hunger is the best sauce” is a quaint old wives tale, or not really true, like how they used to say “Eat your mashed turnips–children in Africa are starving”. It sounds good and moralizing, but doesn’t really make sense. Well, for your information, it’s not a quaint old wives tale. The only reason why people (or, at the very least, Americans) think so is because they have so very rarely been hungry, if ever. O, they may have thought so. No doubt they even said the were starved, famished, and weak from lack of nourishment. No doubt they even believed it. But I sincerely doubt they had even begun to be hungry. More likely, they were simply no longer full. Which is nearly just as scandalous, I’m sure. I find this double standard absurd: at wine tastings they will carefully spit out each mouth full of wine, so as not to actually ingest it, and so have their palate dulled by lack of appetite for wine. And yet, at fancy food tastings they don’t have everyone bike for half an hour before hand, or some other sort of mild but true exercise. Don’t they know that being even mildly hungry refines the tastebuds, making every flavor more full and defined? Don’t they know that an unhungry person can detect half as much subtlty as someone prepared to eat? Don’t they realize that all but the bluntest and most powerful flavors are wasted on those who have no need of food? I’ve often wondered if that’s the reason that in fancy restaurants you can’t tell which things are supposed to be the food and which are supposed to be the decoration. Since people who aren’t really hungry can’t really taste, food of necessity gets judged by other standards. How does it look? Oo, the red looks so pretty next to the green. Look how small it is! Isn’t it just darling? How much does it cost? Ouch! Well, you know you’ve eaten good today. No, you haven’t. You can’t eat “good” unless you need to eat. Eating is practically America’s favorite pastime, and yet (or, perhaps, because of it) people have largely forgotten the whole purpose of eating. (Incidentally, they have also forgotten the meaning of the words “hungry” and “starving”. Starving takes a lot longer than you would think.) Eating is about satiating hunger. Eating is about filling what’s empty. Eating is about sustaining and cultivating life. You would never know that by watching their eating habits. There are the conscientious type, who obsess over counting calories. There are the food-y types, who believe in eating expensive food, no matter how gross it is. There are those who eat simply because it’s a thing to do, and not unpleasant. But none of them seem to realize that the best time to eat is when you’re hungry, and the best time to stop is when you’re not. They cannot even begin to realize what they’re missing out on, because they haven’t been hungry. If they realized how much worse food tastes when you are simply shoveling it in to a mouth that doesn’t care—well, in all honesty, they probably wouldn’t do much different. Let’s face it, you can spit out a mouth full of wine without getting all sweaty–it’s just so much more a reasonable course of action. 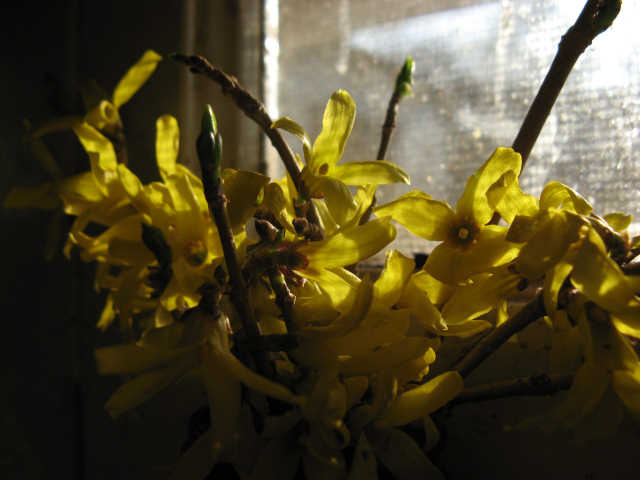 But not being able to discern tastes, they turn to the basest of instincts: salt, sugar, and fat. Needless to say, the conscientious type people therefore declare war on salt, sugar and fat. A pointless, and terribly faulty, argument. There is nothing wrong with salt, sugar and fat. The problem is that they eat when they are not hungry, and they don’t stop. I pity the fancy-cook, who must try to find some way to amuse his mindlessly eating audience. He may have awards stacked up to the ceiling, but he has yet to actually cook, or have his work enjoyed. I pity the one who has been deluded into thinking the salt, sugar and fat they ingest by the handful is food, or tastes good. Addicting, yes, as the body reacts under it’s most base instincts, but not food. It cannot sustain or nourish life by itself. And it certainly does not attain to truly tasting good–it does taste, however, and if your senses are so dulled that almost anything that has a taste is said to have a good taste, you might think it meets the requirements. To feed someone is to provide nourishment. To eat is to be nourished. If those before you are in no need of food, if you have no hunger that needs to be silenced—what is the point of food? 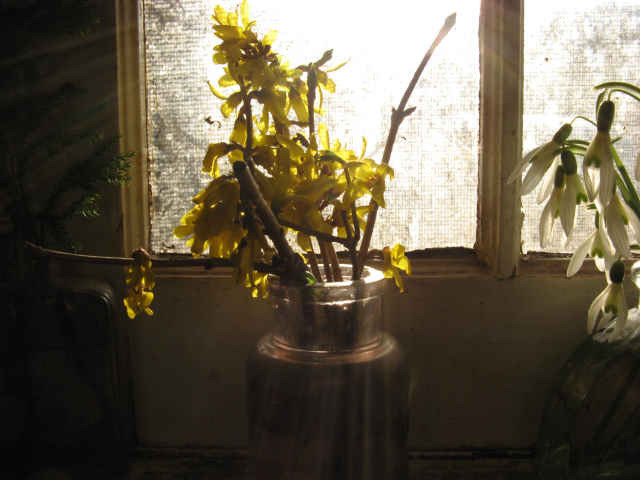 It is diminished. It is a play thing. And your tastebuds are diminished. It is all still there, but it’s not being tasted, and it’s not being used. Only cook for hungry people. Otherwise, it’s a waste of time. And food. A Barbarian's Taste. . . When it comes to food, barbarians are a lot more picky than you might expect. In fact, food might be the one thing barbarians care the most about. It has to be hot. It has to have meat in it. Fish is not a meat; it’s a vegetable. When in doubt, add extra virgin olive oil, garlic, onions and tomatoes. Peanut butter is a poison. Meat is not to be consumed unless it’s dead. Meat is not dead unless there is no pink in it. The four food groups are: beef, potatoes, gravy, and pie. Barbarians have more than four food groups. Also included are: pasta, brownies, chicken and garlic. The more a “food” is processed, the more it becomes like garbage. Fresh ingredients are always superior. Pasta is always al dente. Eggs are great. Favorite ways to prepare them include: brownies, chocolate eclairs, chocolate cream pies, pound cake, and other egg-rich pastries. If that store-bought white bread really were made out of sawdust, it would probably be better. Don’t eat it. Rice is neither vegetable nor starch; it is a non-food. Cranberry sauce is a vegetable. You cannot have too much garlic. Orange juice trumps soda, every time. After dining, you don’t have to wipe your hands off on your clothing. You can always use someone elses. Quiche is not even worth addressing. Even you know better than that. So is mozzerella, extra-sharp cheddar, sharp cheddar, monterary jack, colby, colby jack, ricotta, and pepper-jack. Cottage cheese is not good. American cheese is not a cheese. Potatoes taste good when cooked in duck fat. Store bought broccoli has almost no comparison to the vastly superior homegrown broccoli. 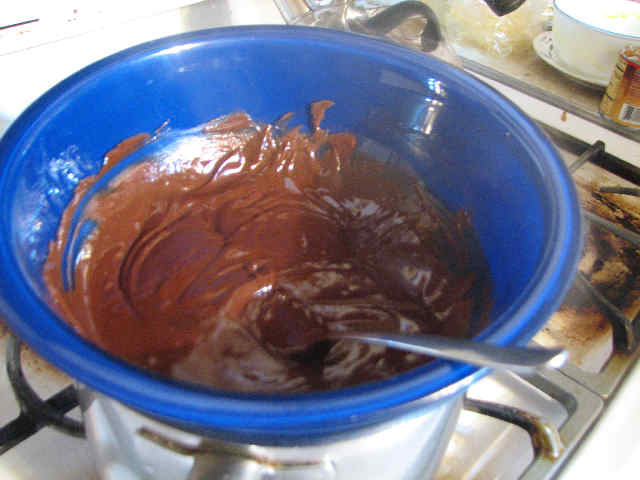 Cake mixes are kind of vile, and not really worth making. Good applesauce is neither watery nor sweet. If it has tentacles or looks like a bug or grub, it’s not food. Beans are a risky business; They can be edible, but they count as neither a starch nor a protein, so they are never anything more than accessories. A soup is a simply a drink. If you’re trying to make a meal, it must be either a stew or a chowder. They have many other such statutes and proverbs; but this is enough to get you started, should you ever have a horde of barbarians to feed.